Lot Detail - A Fiery Southern Belle "Could Shoot Down The Yankees As Fast As You." A Fiery Southern Belle "Could Shoot Down The Yankees As Fast As You." A great Southern young lady's letter, 1 1/2pp. folio, written by Carrie A. Raines, Milledgeville, Ga., Nov. 15, 1861 to her soldier brother Pvt. Thomas T. Raines 45th Georgia Infantry (WIA Mechanicsville, Va., 6/26/62; POW Fort Stedman, Va. 3/25/65 confined Point Lookout, MD), reading, in part: "…I received a letter from Elisha…he was well…has been in a fight and the Yankees hit the tree he was standing behind don't you think they was…pretty close to the old fellows hat…I did not think that I could miss you so much until you left…but bud Tommie I know that it is your duty to go and do all you can in defense of your country…may you ever be a brave and noble patriot and never shrink from the duty that is set before you…Lizzie and Jane…they told me to tell you if the Yankees get too thick down there to send word and we will make up a company of girls and come down there and cook for you all and let you keep fighting and if they begin to get the advantage we will turn in and help fight…you know from experience that the Baldwin [County] girls are all very brave girls and could shoot down the Yankees as fast as you…your sister in haste, Carrie A. Raines." 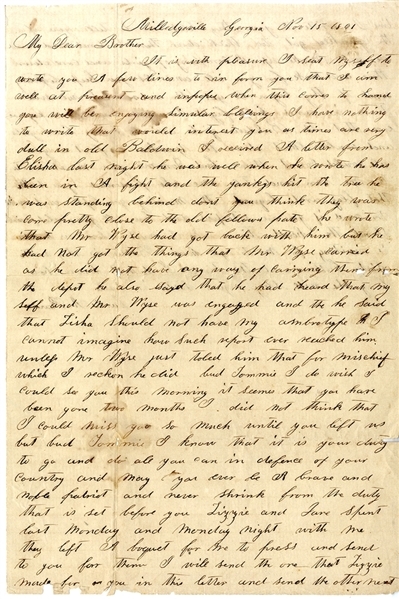 Please see her brother's battle of Chancellorsville letter elsewhere in this auction. Minor chipping along the margins, else VG.